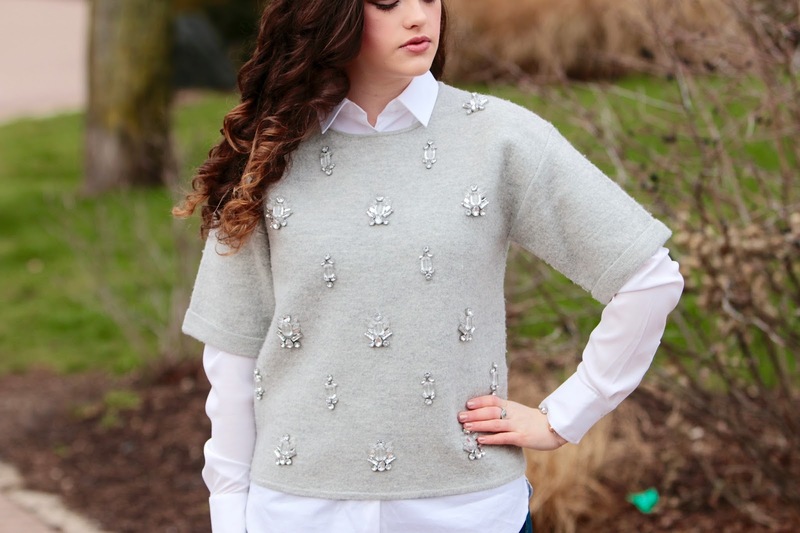 An embellished sweater can change your life. 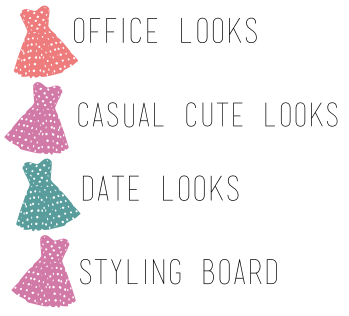 Hear me out: ever have one of those days/nights when you know you have to look 'nice' (whatever that may mean) but you're so not in the mood to get dolled up and wear something that has any potential of being uncomfortable, unattractive, or unpredictable? WELL, introducing the embellished sweater - aka the answer to your fashion problems (cue applause). A decked-out sweater is not only an answer to the infamous question, "What should I wear tonight?" It's the answer to said question. This structured knit is made out of wool, which makes it super warm, but it's also the perfect piece for a special occasion. 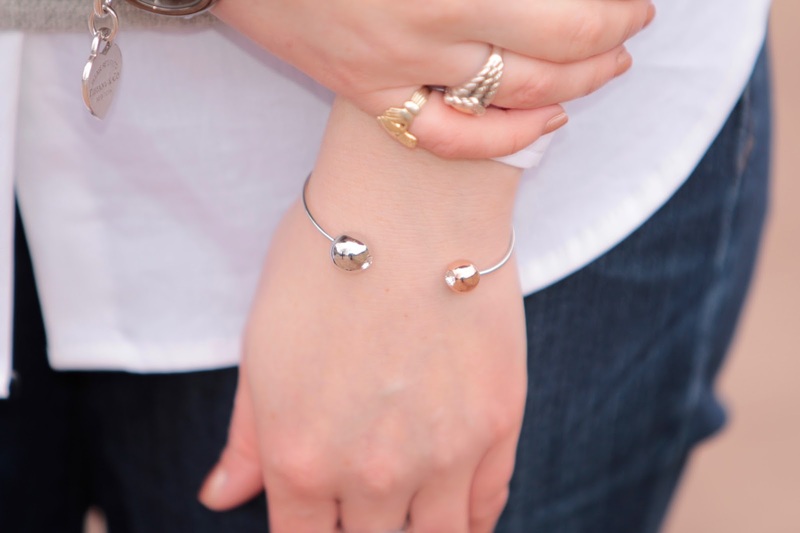 The gemstones give it polish but the soft texture and generous fit make it ideal for T-shirt lovers everywhere. Yay, win-win for everybody! The trick to pulling off wow-worthy embellishment during the day? Grounding gleaming pieces with a dark neutral like black and/or denim. These glittery earrings echo the crystals on my top. And because I didn't need a necklace, I wanted something a smidge dramatic to increase the party vibe of this look even more. 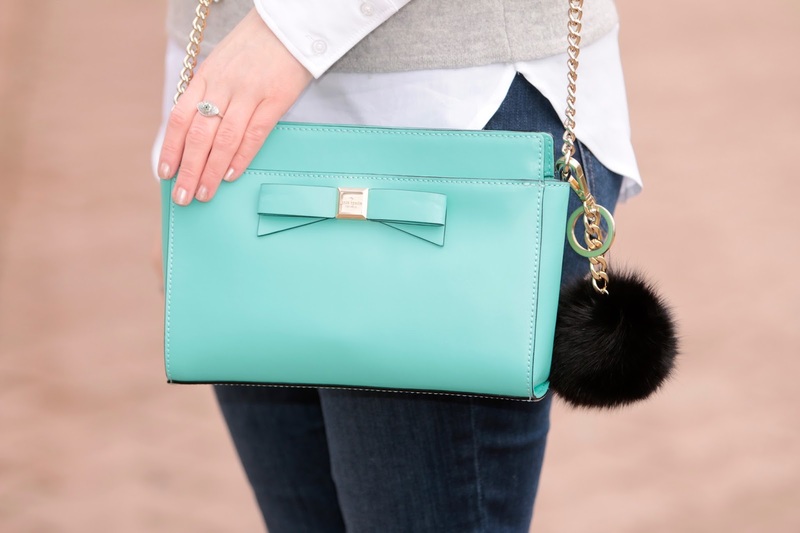 This Tiffany Blue purse is such a dream, isn't it? I love Kate Spade to death and this bag of hers is near perfection. From its attention-grabbing color, structured silhouette, and bow detail, this purse makes one heck of a companion. 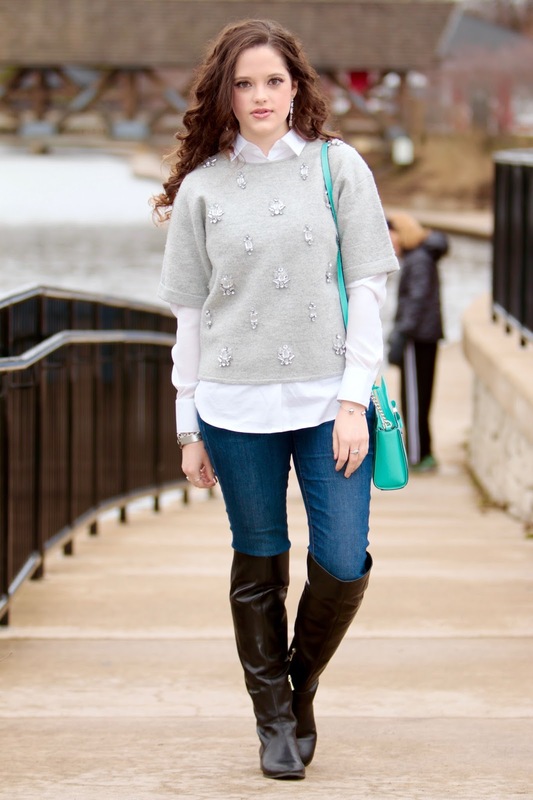 I love wearing it with neutrals to make it really stand out! With such a stellar sweater as this, there's no overwhelming need to go hog wild on the accessories. I kept my extras pretty simple, like with this elegant cuff by Ted Baker. It's hard to resist a dainty accent! So NYC finally got its first snow over the weekend! I'm telling you, we've been so spoiled with this unseasonably warm weather and I am not hating it! In my opinion, temps should not be allowed to dip beneath 35 degrees. But it WAS magical to experience the snowfall - even if it didn't stick! 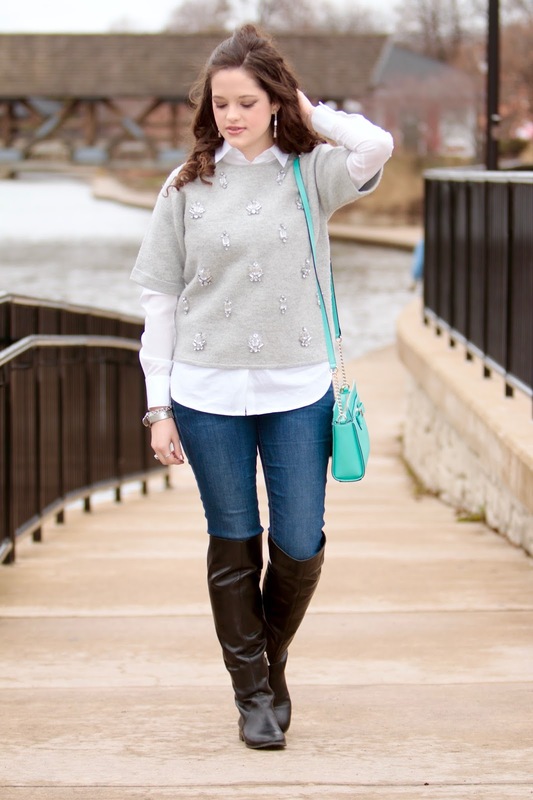 Your sweater is so pretty, I love the embellishments! What a lovely post dear! Like it so much!! 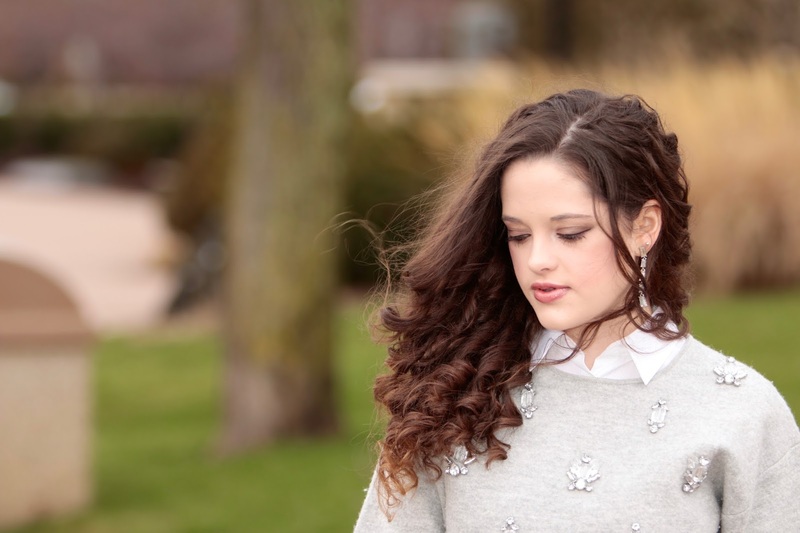 Check out my latest OOTD! 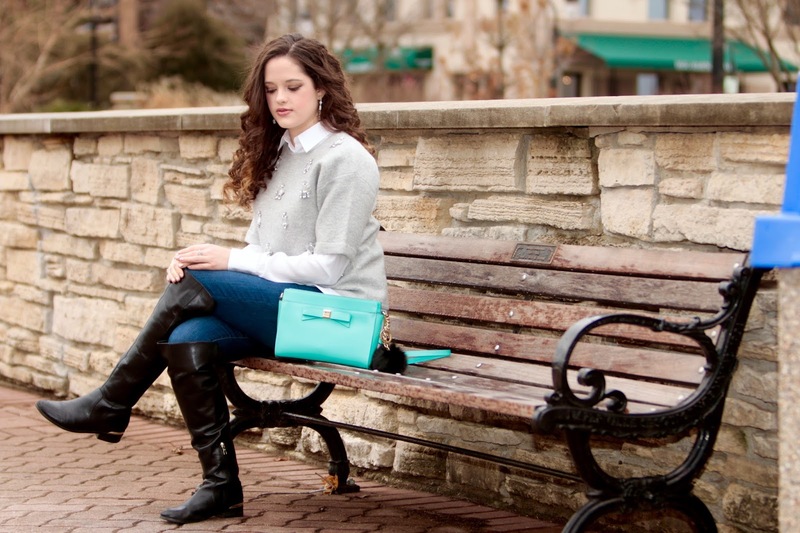 The jewels on this sweater are so beautiful, and I LOVE the little teal bag! 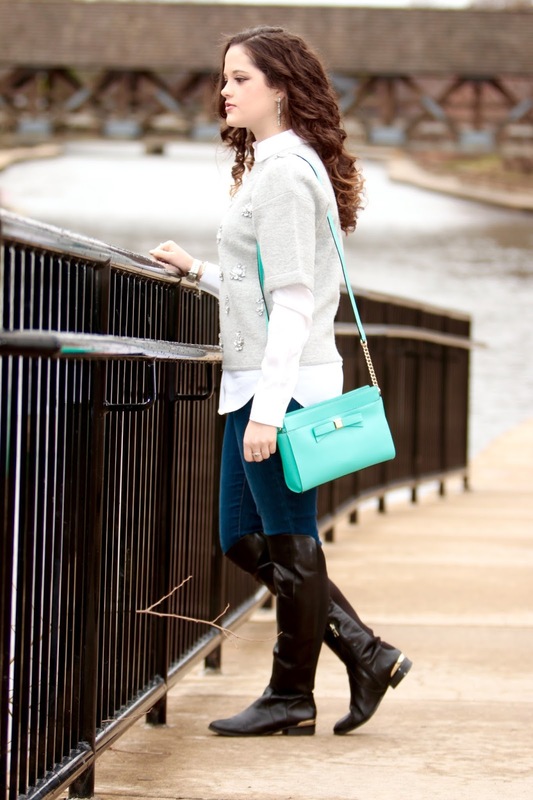 Lovely sweater and Cool boots, the tiffany green bag is the perfect touch of color!!!! You know I have been wanting one of these, I tried one on but forget where I was, it was on sale but did not fit me correctly. Hopefully I will find one soon! This is a great find. A little sparkle really does go a long way! Whoever came up with the idea is genius! What a beautiful top! You look stunning! I love your sweater! Embellishments are always my favorite. They make every day pieces feel extra special. This is such a beautiful look. I love the embellished sweater, the colour suits you so much! Can't agree with you more, Kat! 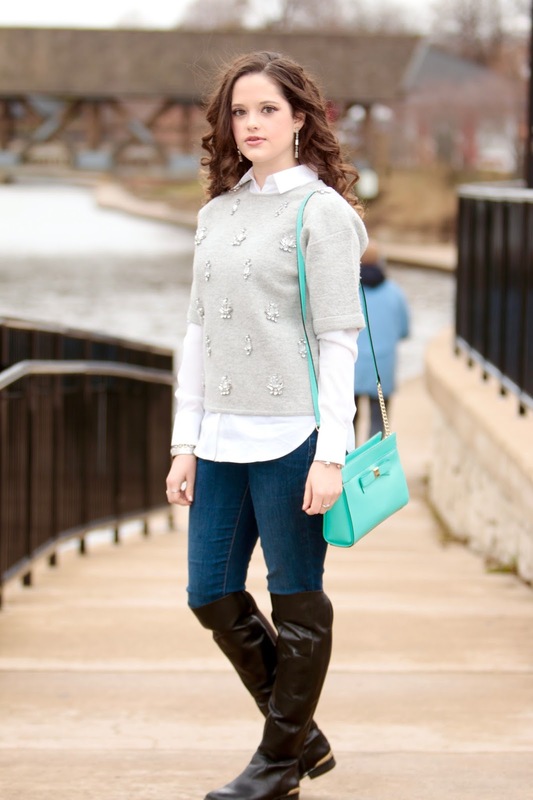 A great embellished sweater certainly goes a long way. it's always a classic staple that never goes out of style. I love it with the classic crisp white shirt and boots! 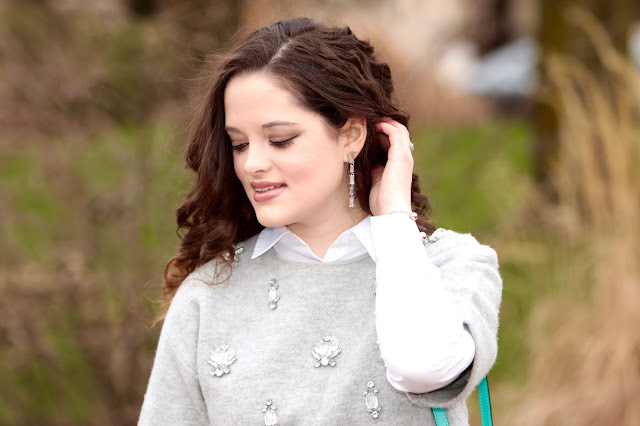 I always loved embellished sweaters for some reason, I think wearing glitter/crystals always makes a girl feel a little more special! 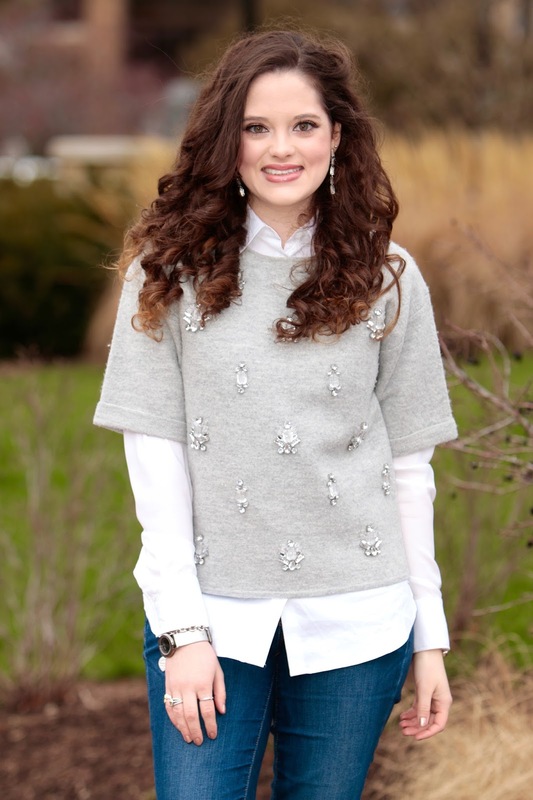 I completely agree about embellished sweaters...they can be so useful :) Love your sweater here, you look stunning!! Love your beautiful top!! Looks so attractive!! 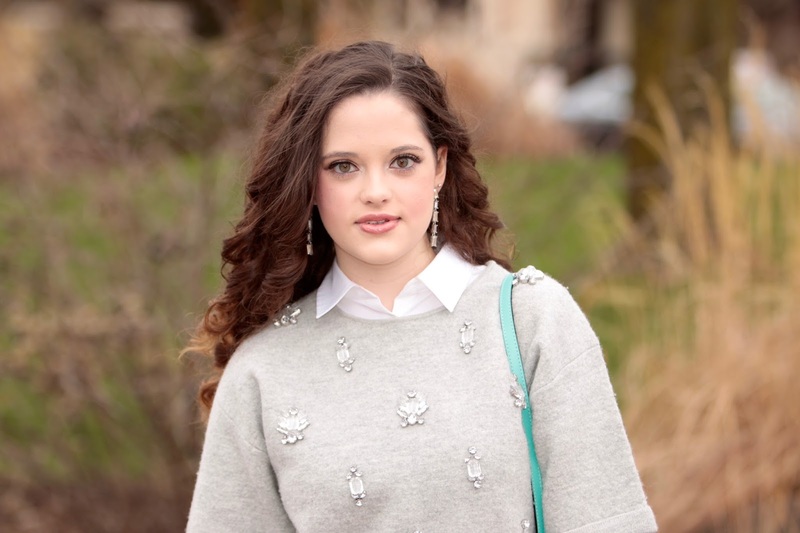 I love your sweater, such fun embellishments! You look great! Amazing sweater! 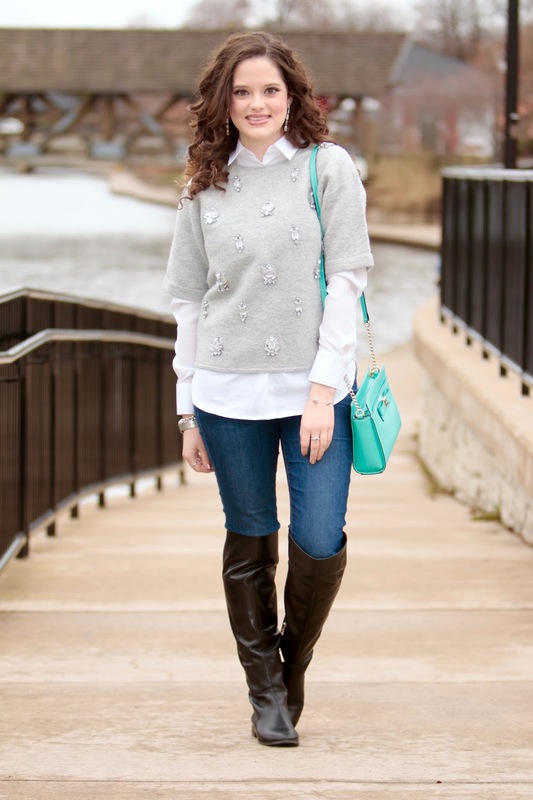 LOVE this embellished sweater and so cute over a white button up! I love your sweater it's very cute with the embellishing, and I love how you styled it with those knee high boots gorgeous. 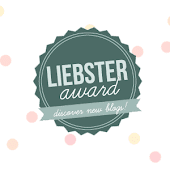 Also I am new to blogging please check out my blog and let me know what you think…thanks. 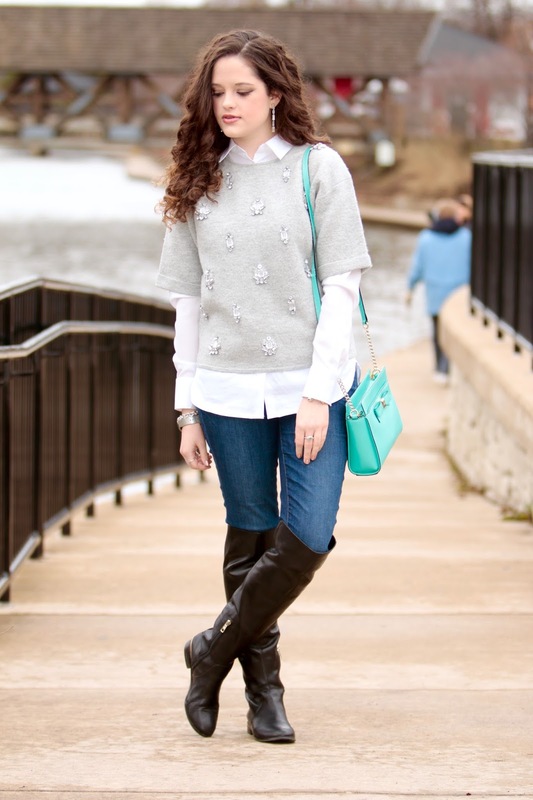 The sueter is nice, denim pants and white blouse make a perfect match!